YOU ARE LOOKING AT A PAIR OF ANKLE STRAP DANSKO'S COMFORTABLE WORK, DRESS STRAPPY SANDALS WITH 3 1/4" POLYURETHANE HEEL AND OUTSOLES (WOOD LOOK). SIZE 9.5-10, EUR 40. BROWN LEATHER UPPER AND LINING WITH TACK DESIGN AROUND THE OUTSOLE. These have been scuffed on the sole to avoid slipping, but have never been worn. Uppers have no scuffs, marks or other signs of use. The block style stacked heel is 3" high and the toe is rounded. These have a cushioned insole that make them comfortable to wear in the office or for going out. New BP. Womens Grey Velour High Heel Open Toe Ankle strap Buckle Dress Shoes. They were tried on and worn for a few minutes thus there appears to be a foot traffic impression on toe area. Shipped with USPS Priority Mail. Coach Sherry Peep Toe Sling Back High Heel Sandals, Size 9.5. Shipped with USPS Priority Mail. Super stable and comfortable. Size 9.5M, black patent leather. Aerosoles is trend-right footwear that you will reach for in your closet again and again. Patent upper. Roomy round toe. These are back in style!!! This is the actual item you will receive. Madewell Black Suede Mule Slide Block Heels 9.5 EUC. Condition is Pre-owned. Shipped with USPS Priority Mail. Only worn once. In excellent condition. Item must be paid for via paypal within 48 hours of auction end. 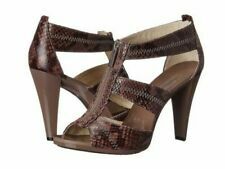 This is a gorgeous pair of Cole Haan Minetta sandal heels just in time for spring! They come mint in their original box, size 9.5. They are black and grey and cream and have an amazing 4 inch block heel. They originally sold for $248! Thanks for looking! The heel is 4" tall. We want to fix it and make it right. We will work hard to resolve your issue quickly. Preowned! Easy Spirit Women’s Pumps Black Shoes size 9.5 Heels Excellent Condition No significant signs of wear. Upper leather Quilted soft cushion footbed. Rubber sole for extra comfort These are comfortable & stylish Great for work The patent leather toes add sophistication & class without breaking your wallet. Steve Madden High Heel Open Toe Ankle Strap 9.5 M, Beige has a couple marks on the heel, otherwise very nice condition. 4 1/2" heal. Please ask any questions and thank you for looking. Cute open-toe with crossover design. Adjustable buckle on ankle strap provides custom fit. 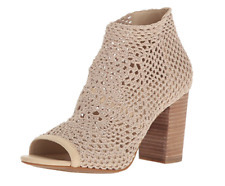 Trendy stacked block heel. Massimo Baldi Shoes Animal Print Peep toe Platform Stilleto's Leather uppers. Soild black heels and platform. . In excellent condition. Seychelles Soft Leather Strap high heels. • the white cloth mannequin I use in most of my photos is a 37 bust 27 waist dress form, size 8 or S/M. • I double check the neck, the seams, the closures, underarms and the hems for signs of wear. 90's Style White Platform Heels Funtasma Chucky Shoes. No Size listed anywhere i believe these are a size 9.5 - 10. Inside sole coming out. Pre-owned TORY BURCH “Aaden” Almond Leather Heels - Size US 9 1/2. Calvin Klein. Calvin Klein Stud Heel Detail. Black Lizard. Style Olive 2. 3 1/2" Heels. B.O.C BORN CONCEPTS Comfort Shoes. If you are dissatisfied with your item or have any concerns. CONDITION: Preowned with original Box. Has light surface scratches, scuffs, creases, marks & minor dirt/wear on insides and bottom soles. CRISS CROSS TWIST FRONT. BUCKLE HEEL BACK. A3080 LADONNA. Material: Leather / Canvas / Wood. and you reap the benefit (looking good)! Condition: Good Used Condition. This item has been thoroughly inspected for flaws, stains and tears. Insole width at widest point: 3 1/4". Very Good Condition; moderate wear on outsoles. COACH Francie Black Leather High Heels. Gently pre-owned. Minor wear to uppers and soles/heels. Good used condition. Sturdy shoe. Minimal signs of wear as shown in photos. They have a cute animal print on the sides. The leather uppers show small amounts of wear with no blemishes to list, except a couple of superficial scuffs. Super comfortable, fun and well made by Fossil.